What do these three things -- JJ Abrams, Mystery and TED -- have in common? JJ Abrams' TED talk, appropriately entitled, "The Mystery Box" (I've embedded the video at the end of this post). It's a great talk, informative yet personal. He's an amazing speaker. If anyone knows about mystery it's Abrams. I looked him up on Wikipedia to research this post and was--the English have a word for this -- gobsmacked (love that word!) by the number of his accomplishments. Did you know he created Alias? I knew he co-created Lost and Fringe, as well as Person of Interest and Alcatraz. Which means he has had a role in creating just about all my favorite TV series! His list of credits goes on, and it's well worth the read (click here for JJ Abrams' Wikipedia page), but what I thought was the most interesting was the way ... well, his TED talk was different. I've seen my share of TED talks, and they have all been inspiring and informative, but Abrams did one of the best I've seen. Not only did he talk about Mystery and the role of mystery in his work, his writing, but he wove a story into the talk itself, cleverly manipulating the viewers' emotions and then, when you least expected it, when you had been lulled into a feeling of security ... BAM! You felt the emotional punch of what he was saying. He reminded me that good writing manipulates the emotions of your audience. I've never read one of Abrams' screenplays, but if he writes like he talks, then he's one heck of a writer. 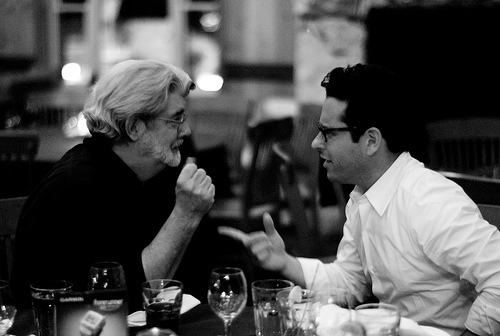 Photo credit: "George Lucas and JJ Abrams" by Joi under Creative Commons Attribution 2.0.